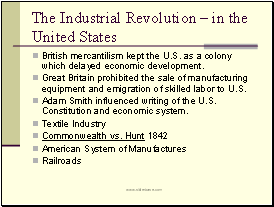 British mercantilism kept the U.S. as a colony which delayed economic development. 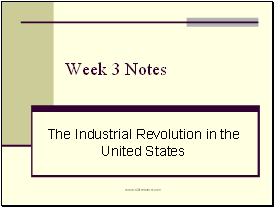 Great Britain prohibited the sale of manufacturing equipment and emigration of skilled labor to U.S.
Adam Smith influenced writing of the U.S. Constitution and economic system. 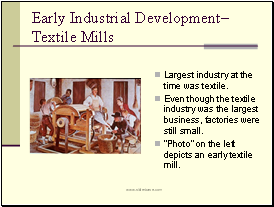 Largest industry at the time was textile. 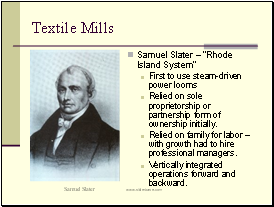 Even though the textile industry was the largest business, factories were still small. 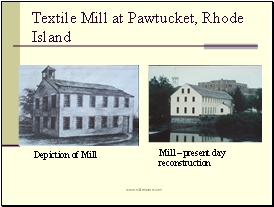 “Photo” on the left depicts an early textile mill. Relied on sole proprietorship or partnership form of ownership initially. Relied on family for labor – with growth had to hire professional managers. Vertically integrated operations forward and backward. Hired non-family supervisors & managers with corporate model. 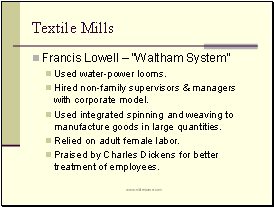 Used integrated spinning and weaving to manufacture goods in large quantities. Relied on adult female labor. Praised by Charles Dickens for better treatment of employees. 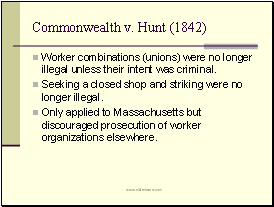 Worker combinations (unions) were no longer illegal unless their intent was criminal. Seeking a closed shop and striking were no longer illegal. Only applied to Massachusetts but discouraged prosecution of worker organizations elsewhere. 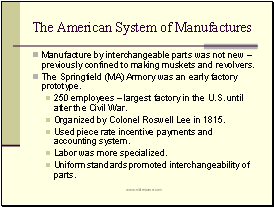 Manufacture by interchangeable parts was not new – previously confined to making muskets and revolvers. The Springfield (MA) Armory was an early factory prototype.